Camping pods have arrived at our Lincolnshire campsite. If you love being outdoors in the countryside, but aren’t too keen on playing Russian roulette with the British weather, then maybe our camping pods are for you! Our camping pods are clearly set-up for you when you arrive, so all you have to do is move in! If it’s raining you are protected from the elements, warm and dry in the insulated pod. Sheep wool provides the insulation to keep you warm and a special foil layer bounces the heat back if it’s hot. If it is sunny, and let’s hope it is, then the window on the back wall will provide ventilation and a welcome “through draft”. 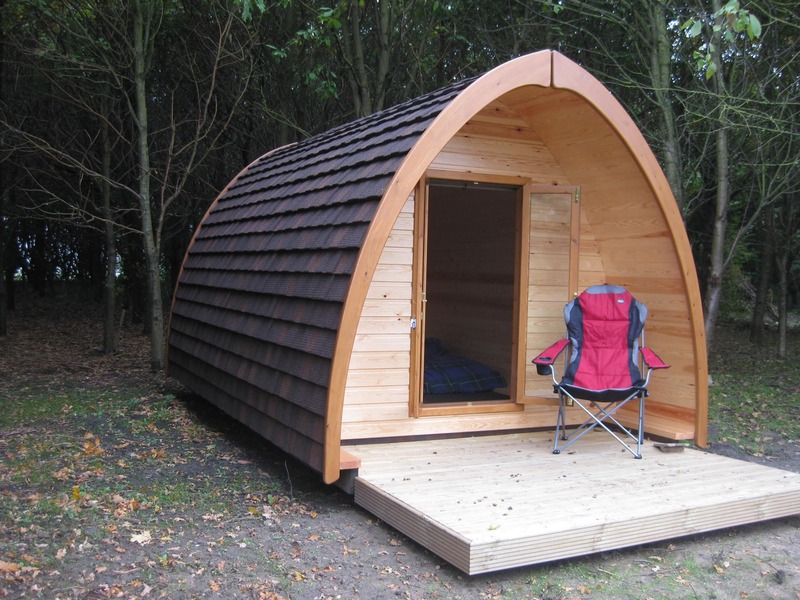 The camping pods are an attractive ark shaped shelter that are sympathetic to their natural woodland setting. It has a carpeted internal accommodation area and the headroom is plenty even for the tall folks. The exterior decking area is somewhere to prepare dinner, kick off your outdoor gear or kick back with a drink and enjoy the sun setting over the wildlife pond. You’ll need to bring our camping gear, just leave your tent at home!